Alfredo Morelos has extended his stay at Rangers, signing a new deal keeping him at the club until 2023. The Colombian forward, whose performances since signing a three-year deal in the summer of 2017 have caught the eye of a string of top clubs, made his international debut in September last year. He has scored 28 goals from 41 appearances this season under Steven Gerrard. Speaking to the Light Blues website, the 22-year-old said: “It did not take me long to agree this extension because my career has progressed quicker and better than I could have expected when I joined this great club. Highlighting Morelos’ scoring record as he welcomed the contract extension, Gerrard added: “It’s always important at big clubs like this one to make sure your top players are secured long term. Alfredo has been excellent for Rangers. 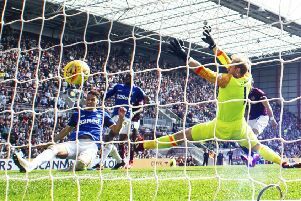 Morelos scored 18 goals last season and was voted Young Player of the Year by Rangers fans. He has twice renewed his contract with the Ibrox club in the last 12 months alone, extending his stay by 12 months in March 2018, tying him to Rangers until 2021, before penning another extension on the eve of an Old Firm clash in September 2018, keeping him at the club until 2022.